More than a third of parents believe their local school will suffer from a firearm incident in the next three years despite school shootings remaining rare, an upcoming study shows. Researchers from the University of North Carolina, Ball State University, and the University of Toledo surveyed 257 randomly selected parents from across the country and found that 36 percent thought it was "highly likely" their local high school would experience a gun incident sometime in the next three years. This is despite the fact, as the researchers note, that school shootings are rare. Only 8.6 percent of the parents said they knew of a firearm incident at their local school within the last five years. The study said 95 percent of firearm-related deaths of students occurred outside of school. The study, Parents’ Expectations of High Schools in Firearm Violence Prevention, is set to be published in an upcoming edition of the Journal of Community Health but is available online. The study asked parents a number of questions on the root causes of firearm violence inside of schools. Seventy-five percent said bad parenting was a cause, 57.6 percent blamed bullying, 54.1 percent said inadequate mental health care services for young people was a cause, 51 percent blamed easy access to guns, and 51 percent blamed gang activity. Only 10 percent said there was some other cause that played a significant role. Researchers asked parents what policies would be effective in preventing school shootings as well. Implementing an emergency alert system and working with law enforcement to design an emergency response plan were the most popular responses with 70 percent of parents agreeing they'd be very effective. Creating a comprehensive security plan, requiring criminal background checks for all school personnel, implementing an anonymous system for students to report concerns about potential violence, and encouraging parents who own firearms to take action to reduce access to firearms in the home all received more than 65 percent support as well. Many other policy ideas were seen as far less effective. Installing metal detectors, bullet-proof glass, or conducting random searches of backpacks and lockers all received 35 percent or less support. Training students to collectively attack and subdue a shooter, requiring translucent backpacks, and requiring Kevlar backpacks were the least popular ideas with less than 15 percent of parents labeling them very effective. The study also polled parents on the most effective measures for reducing firearm violence throughout the United States. Universal background checks at 63.4 percent and increased funding for mental health services at 56.8 percent were the only two proposals that a majority of parents viewed as very effective. Banning "assault weapons" or magazines that hold more than 10 rounds of ammunition were viewed as less effective. Increasing government funding for gun violence research was viewed as the least effective. The researchers said that while parents view gun violence as a major issue, they often don't have a good understanding of what policies might reduce violence in schools. "Gun violence is a major issue among parents, who often have a limited grasp of potentially effective interventions to reduce such events," Jagdish Khubchandani, an associate professor of health science at Ball State University and one of the study's authors, said in a statement. "Some parents are quick to blame others for a shooting because they have no idea how to stop such incidents from happening. In fact, the study suggests that most parents have a limited knowledge of what works and what doesn’t in preventing these incidents." The researchers suggest further regulation of firearms is needed, and gun owners and non-gun owners alike need to work together to reduce firearm violence within schools. "Firearms in the United States are almost as numerous as the population of the United States (317 million)," the study's introduction reads. "If these firearms are not adequately regulated, and currently they are not adequately regulated, they become too easy for untrained, immature youths to access with potentially deadly consequences. Approximately one-third of households with youths younger than 19 years of age have a firearm. In 2015, there were 2,787 firearm deaths of American youths (ages 0–19 years), the majority (59 percent) of which were homicides. All parents, not just firearm owning parents, schools, and various groups in the larger community need to work collaboratively to help reduce the level of firearm violence affecting American youths." John Lott, president of the Crime Prevention Research Center and author of The War on Guns, questioned the study's conclusions and said it largely ignores how much gang violence contributes to the problem. "Even the first sentence of the abstract of this paper gives a misleading impression," Lott told the Washington Free Beacon. "The claim of 2,787 adolescents killed in 2015 by firearm violence ignores that the overwhelming majority of this is gang violence. The CDC puts the number of violence-related firearm deaths for 2015 at 2,687. The number of 17- to 19-year-olds is 1,779, and the vast majority of those are murders. The issues that are listed as the causes have little to do with the problem of drug gang violence in inner cities." Lott went on to say that during the 2015-2016 school year there were 28 shootings at K through 12 schools in America. He said there are around 140,000 schools in America. "So, that implies that 0.03 percent of the K-12 public schools in those years had a shooting," Lott said. "Parents clearly have gotten a very misleading understanding of the issues here from the media. And it is also clear that these researchers have no idea of the role that drug gangs have in the subject that they are discussing. The survey questions deal with mass public shootings, and those shootings are just a fraction of the overall school shootings." 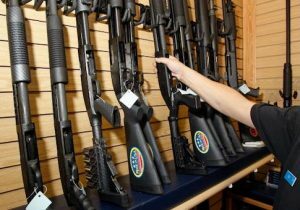 He said the study was framed in a manner designed to scare parents away from owning firearms. "The point about gangs is that these public health researchers want to scare the typical family into not owning guns, when what happens in drug gangs has absolutely no relation to what occurs inside the vast majority of American homes," Lott said. Khubchandani said that while some of Lott's points on the rarity of school shootings and the impact of media coverage on parental perception were valid, the study was not designed to push gun control. "When we start writing a study sometimes we cite facts because they are connected to the bigger public health issue," Khubchandani told the Free Beacon. "So, we didn't mean to scare people and parents." He also pointed out the fact that 58 percent of parents in the study thought assigning a police officer to their local school and 39 percent thought allowing select school personnel to carry firearms would be very effective in preventing gun violence, positions supported by the National Rifle Association.